Welcome to a world where, based on your political preferences, you are probably rooting for or against the success of the NFL. And it’s an exhausting world to live in, isn’t it? Shouts that sports have become too political ring from one side of the isle while the other side cries for more sports figures to take a social stand. And in this war of aggravations, each side has come armed with their own stats and figures to back up their argument. Some point to lower attendance across the league as reason to believe the fans are showing they’ve had enough of the off-field antics, while others point out other plausible reasons for decline. In the chaos of the he-said-she-said from every man, woman, or President with a twitter account, it is hard to figure out what the real significance of these attendance numbers truly are. So, what possible facts could clear up this controversy? Primarily, the attendance or television rating numbers being quoted in the media are comparing this season to last. To get a greater grasp attendance norms in the league, we should look back not only one year, but over several years. 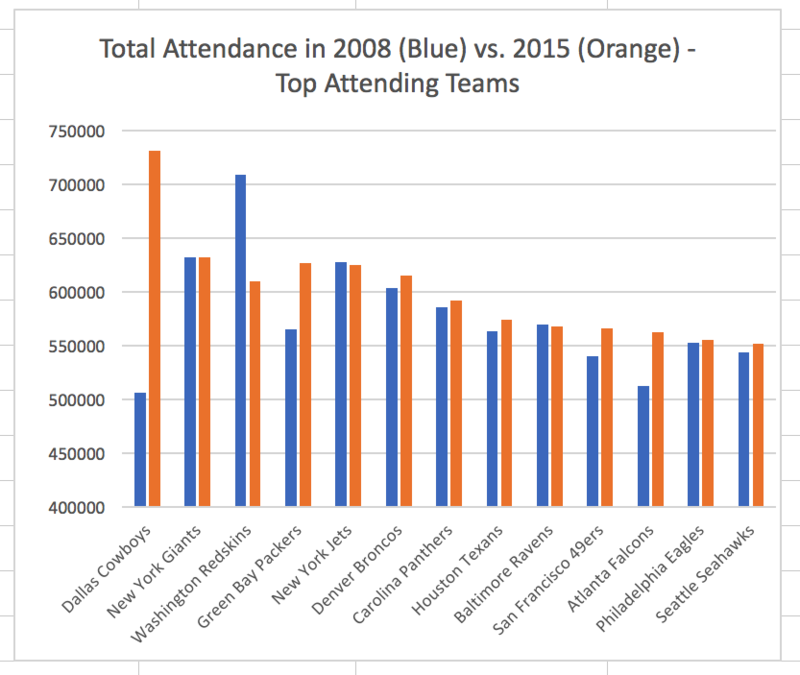 The below charts are comparing attendance for each NFL franchise from the 2008 season and the 2015 season. These charts are not comparing the seasons in between these two years, but these two alone. You may also notice that only twenty-seven franchises are listed, instead of all thirty-two that are in the league. This is because four of those franchises played one less home game in one of these seasons than the other, skewing the true attendance numbers, while one franchise, The Vikings, were removed because they played their 2015 home games in a different stadium due to extenuating circumstances, which also would have skewed the numbers. The list of teams has been broken down into two charts so they will be easier to read. When you look at the data, you may see not see any discernable pattern, because there is no discernable pattern. 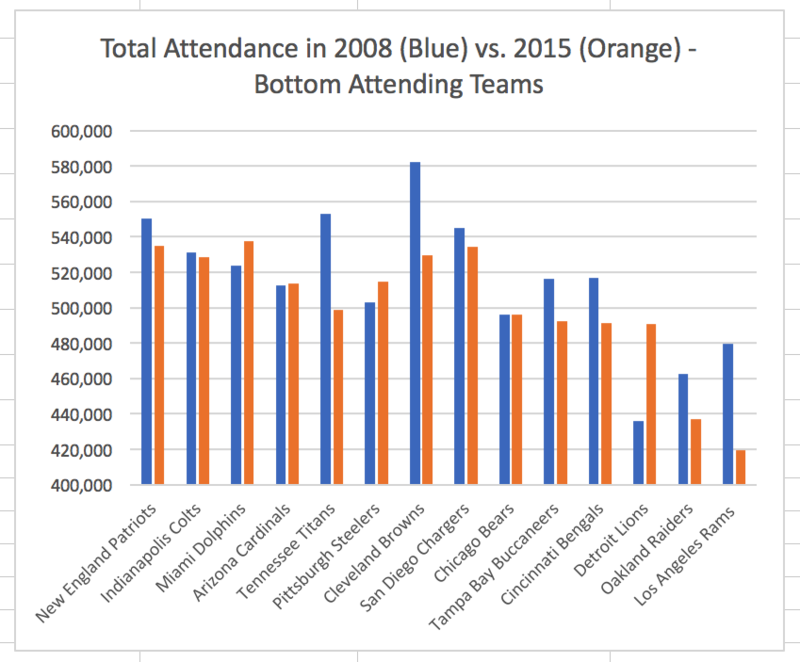 For fourteen of the twenty-seven franchises looked at, attendance went up from 2008 to 2015. Some of these had a total increase as large as nearly 225,000 fans over the course of the season, while others had a total increase of 11 fans over the course of the season. Likewise, thirteen of twenty-seven decreased attendance from 2008 to 2015, some by a little and some by a lot. Just by eye-balling the charts, you can see that we have just about any combination of results that you could imagine. So, what’s the point? Between seasons, attendance numbers are going to bounce, move, shift, plummet, sky rocket, and anything in between. Through their life-cycle they are going to change in any variety of ways, and that is to be expected. The shifting attendance numbers by themselves do not necessarily mean that as a business, the NFL is beginning it’s decent into irrelevance. It may just mean the NFL is having a down year. So much is politically charged right now, but not everything is necessarily politically relevant. This is not to say that there is no correlation between a drop-in attendance and politics, just that it definitely isn’t cut and dry. This blog post was written by Samford University student Stephen Ellison.